I am visiting Penn State next week. I will give a talk. If you are anywhere near State College, Pennsylvania, I hope to see you. 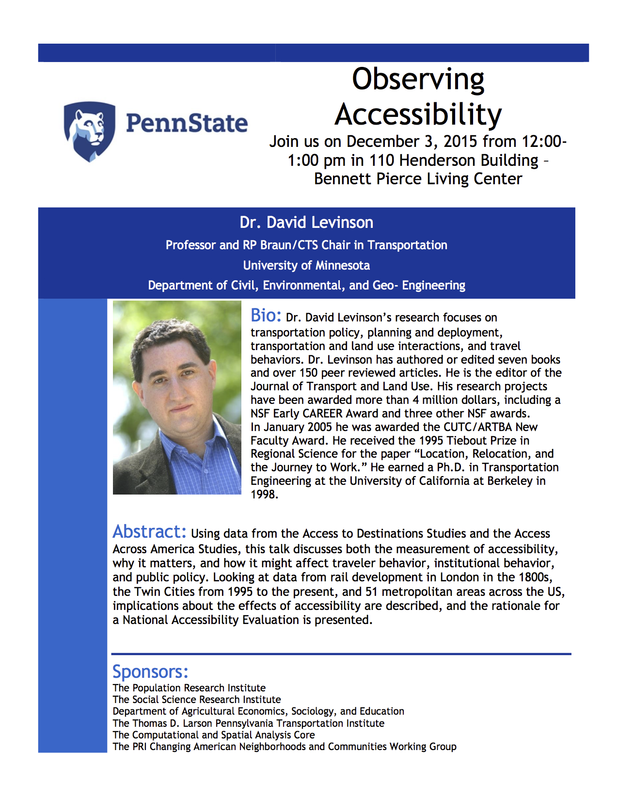 Abstract: Using data from the Access to Destinations Studies and the Access Across America Studies, this talk discusses both the measurement of accessibility, why it matters, and how it might affect traveler behavior, institutional behavior, and public policy. Looking at data from rail development in London in the 1800s, the Twin Cities from 1995 to the present, and 51 metropolitan areas across the US, implications about the effects of accessibility are described, and the rationale for a National Accessibility Evaluation is presented.